Objective: To evaluate the impact of the renal dysfunction (RD) type and change of postoperative cardiac function on the risk of developing acute kidney injury (AKI) in patients who underwent cardiac valve surgery. Method: Reversible renal dysfunction (RRD) was defined as preoperative RD in patients who had not been initially diagnosed with chronic kidney disease (CKD). Cardiac function improvement (CFI) was defined as postoperative left ventricular ejection function – preoperative left ventricular ejection function (ΔEF) >0%, and cardiac function not improved (CFNI) as ΔEF ≤0%. Results: Of the 4,805 (94%) cardiac valve surgery patients, 301 (6%) were RD cases. The AKI incidence in the RRD group (n=252) was significantly lower than in the CKD group (n=49) (36.5% vs 63.3%, P=0.018). The AKI and renal replacement therapy incidences in the CFI group (n=174) were significantly lower than in the CFNI group (n=127) (33.9% vs 50.4%, P=0.004; 6.3% vs 13.4%, P=0.037). After adjustment for age, gender, and other confounding factors, CKD and CKD + CFNI were identified as independent risk factors for AKI in all patients after cardiac valve surgery. Multivariate logistic regression analysis showed that the risk factors for postoperative AKI in preoperative RD patients were age, gender (male), hypertension, diabetes, chronic heart failure, cardiopulmonary bypass time (every 1 min added), and intraoperative hypotension, while CFI after surgery could reduce the risk. Conclusion: For cardiac valve surgery patients, preoperative CKD was an independent risk factor for postoperative AKI, but RRD did not add to the risk. Improved postoperative cardiac function can significantly reduce the risk of postoperative AKI. Following cardiac surgery, acute kidney injury (AKI) is an important complication in patients, occurring with a high incidence of 30%–40%.1 The prognosis of AKI patients is quite poor both in the short term and in the long term, which puts a heavy burden on healthcare budgets.2,3 Preoperative renal dysfunction (RD) has been shown to be a high risk factor for cardiac surgery-associated AKI.4,5 Jyrala et al reported that in patients who received on-pump cardiac surgery, 20.6% had preoperative serum creatinine (SCr) levels ranging between 1.3 and 2.2 mg/dL. Furthermore, a modest increase in SCr levels added to the risk of postoperative AKI and to short-term mortality, even for long-term poor outcomes.6 Aljadayel et al studied 340 patients who underwent cardiac valve surgery and found that 80 patients (30%) had preoperative mild RD, with the glomerular filtration rate estimated to be <60 mL/min/1.73 m2, and this preoperative mild RD is an independent marker of postoperative morbidity (more red blood cell transfusions, reoperation, and longer hospital stay).7 With age and increasing preoperative comorbidities including diabetes, hypertension, and peripheral angiopathy, the proportion of RD also increased, with the prevalence being ≥20%.8 However, the pathophysiology of preoperative RD in patients who undergo cardiac surgery is quite unique. It is often caused by acute factors (cardiac shock/arrest, acute decompensated heart failure [ADHF], etc.) in a short period of time, but it may be reversible after the relief of these pathologies. Cardiac surgery is the only way to relieve hypoperfusion of the kidneys and maybe helpful in patients with reversible renal dysfunction (RRD). Thus, the judgment of the type of RD may be very important for surgical planning. But most studies on RD have mainly concentrated on chronic kidney disease (CKD), which is an irreversible condition,9 and as far as we are aware, there are no studies about the relationship between improved cardiac function and renal outcomes. 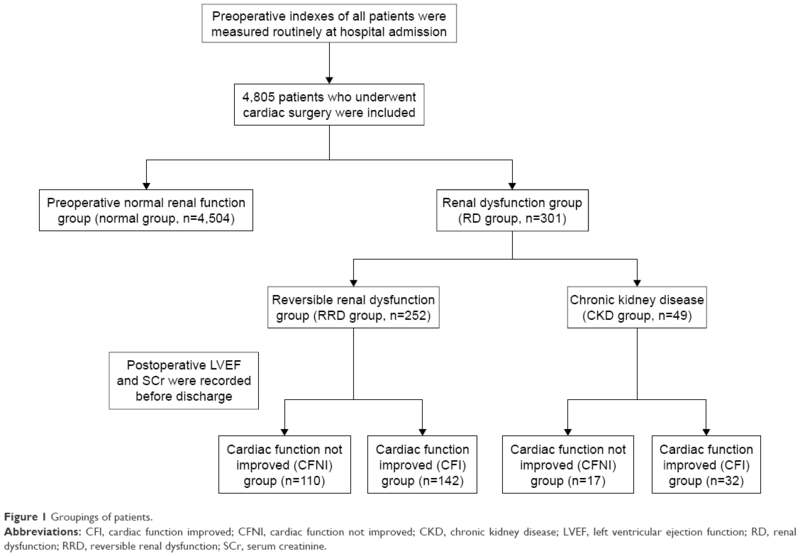 In the present study we compared changes in renal and cardiac functions of RD patients who underwent cardiac valve surgery, in order to evaluate the impact of the type of RD and changes in cardiac function on the risk of AKI and the short-term outcomes. The ethical committee of the Shanghai Zhongshan Hospital approved the study and written informed consent was obtained from all patients. Our study was performed in accordance with the Declaration of Helsinki regarding the ethical principles for medical research involving human subjects. The investigation was a retrospective, observational study in a cohort of patients who underwent cardiac surgery in Shanghai Zhongshan Hospital between April 2011 and February 2015. The study included adult patients with preoperative SCr >1.2 (female)/1.5 (male) mg/dL.10,11 Exclusion criteria were being <18 years old or had received renal replacement therapy (RRT) before surgery due to acute symptoms. AKI was defined using the Kidney Disease: Improving Global Outcomes (KDIGO) 2012 criteria12 as the absolute value of the SCr increase ≥26.5 mmol/L within 48 h or an increase of >50% compared to the baseline values within 7 d, or a urine output of <0.5 mL/kg/h at ≥6 h.
CKD was diagnosed using the criteria defined in the KDIGO13 as follows: 1) kidney damage for ≥3 months, either functional or structural abnormalities, with/without a decrease in glomerular filtration rate (GFR); 2) A GFR <60 mL/min/1.73 m2 for ≥3 months, with/without damage to the kidneys. GFR was calculated using the chronic kidney disease epidemiology collaboration (CKD-EPI) equation: estimated GFR (eGFR) = a × (SCr/b)c × (0.993)age where a =144 (females)/141 (males); b =0.7 (females)/0.9 (males); c = female: −0.329 (SCr ≤0.7 mg/dL)/−1.209 (SCr >0.7 mg/dL), male: −0.411 (SCr ≤0.7 mg/dL)/−1.209 (SCr >0.7 mg/dL). RRD was defined when patients had a preoperative SCr >1.2 (female)/1.5 (male) mg/dL but had not been diagnosed with CKD, probably caused by I or II cardio-renal syndrome (CRS), or other acute causes. ΔLVEF (left ventricular ejection function) = postoperative LVEF − preoperative LVEF; cardiac function not significantly improved: (CFNI) = ΔEF ≤0%; cardiac function improved (CFI) = ΔEF >0%. Preoperative LVEF was measured routinely at hospital admission. Postoperative LVEF was recorded before patient discharge, after the patient had been transferred from ICU to a ward. No cardiotonic agents were used at that time as they may have impacted the results. SCr at discharge was recorded as the last measurement before discharge, to prevent hemodilution due to fluid resuscitation after surgery. All patients who underwent cardiac surgery were grouped as follows: the preoperative normal renal function (normal) group (n=4,504) and the preoperative RD group (n=301). Depending on postoperative cardiac functional changes, the RD patients were arranged into the CFI group (n=174) and the CFNI group (n=127). They were further divided into four subgroups: CKD and the CFI group, CKD and the CFNI group, RRD and the CFI group, RRD and CFNI group, respectively (Figure 1). The AKI, AKI–RRT incidence, and in-hospital mortality were the primary endpoints. Figure 1 Groupings of patients. Abbreviations: CFI, cardiac function improved; CFNI, cardiac function not improved; CKD, chronic kidney disease; LVEF, left ventricular ejection function; RD, renal dysfunction; RRD, reversible renal dysfunction; SCr, serum creatinine. All data were analyzed with SPSS for Windows (Ver. 16.0., SPSS Inc., Chicago, IL, USA). Normally distributed data are presented as the mean ± SD; comparisons between groups were made using the two independent sample t-tests. Nonparametric data are presented as medians (25%–75% interquartile ranges). The Wilcoxon test was used to compare two dependent variables, a nonparametric Mann–Whitney test for comparing independent variables, and a chi-squared test for comparing between groups. Logistic regression analysis was used to investigate the influence of multiple factors on the incidence of AKI. A P-value <0.05 was considered to be statistically significant. A total of 4,805 patients underwent cardiac valve surgery from April 2011 to February 2015, including 4,504 (94%) in the normal group and 301 (6%) in the RD group. Of the 301 RD patients, there were 252 (84%) in the RRD group and 49 (16%) in the CKD group. Patients in the RRD and CKD groups were older than in the normal group, with significantly more male patients. Comorbidities including hypertension and diabetes were significantly greater in the RRD and CKD groups than in the normal group. Preoperative SCr and SCr levels at discharge in the RRD group were significantly lower than in the CKD group (1.4±0.4 vs 1.8±0.7 mg/dL, P<0.01; 1.5±0.9 vs 1.9±1.0 mg/dL, P<0.01). The length of stay in hospital in the CKD group was significantly longer than in the RRD and normal groups (20±14 vs 16±8 d, P<0.01; 20±14 vs 13±8 d, P<0.01) (Table 1). Notes: aP<0.05 RRD vs normal group; bP<0.05 CKD vs normal group; cP<0.05 RRD vs CKD group. Abbreviations: BMI, body mass index; CHF, chronic heart failure; CKD, chronic kidney disease; CPB, cardiopulmonary bypass; eGFR, estimated glomerular filtration rate; ICU, intensive care unit; LVEF, left ventricular ejection function; RRD, reversible renal dysfunction; SCr, serum creatinine. Of the 301 RD patients, 174 (58%) were in the CFI group and 127 (42%) were in the CFNI group. 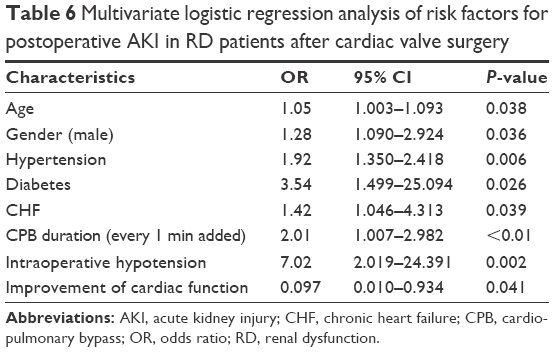 The AKI and AKI–RRT incidence in the CFI group were significantly lower than in the CFNI group (33.9% vs 50.4%, P=0.004; 6.3% vs 13.4%, P=0.037) (Table 2). Notes: aP<0.05 compared with CFNI group. AKI 1,2 and 3 represent AKI stage 1,2 and 3. Abbreviations: AKI, acute kidney injury; CFI, cardiac function improved; CFNI, cardiac function not improved; RRT, renal replacement therapy. The incidence of AKI in the RRD group was significantly lower than in the CKD group (36.5% vs 63.3%, P=0.018). The AKI and RRT incidence and in-hospital mortality in the RRD group were significantly greater than in the normal group (36.5% vs 28.4%, P=0.006; 8.3% vs 2.0%, P<0.001; 6.0% vs 2.6%, P=0.002). Subgroup analysis showed that there were no significant differences of AKI incidence and in-hospital mortality in the RRD + CFI group and the normal group (30.3 vs 28.4%, P=0.624; 4.2% vs 2.6%, P=0.234). The RRT incidence in the RRD + CFI group was significantly higher than in the normal group. The AKI and RRT incidence and in-hospital mortality in the RRD + CFNI group were greater than in the normal group (Table 3, Figure 2). The incidence of AKI and RRT and in-hospital mortality in the CKD group were greater than in the normal group (63.3% vs 28.4, P<0.001; 14.3% vs 2.0%, P<0.001; 10.2% vs 2.6%, P=0.001). 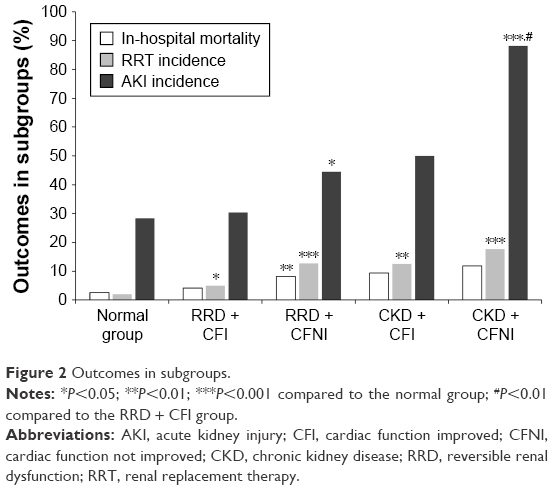 Subgroup analysis showed that the incidence of AKI and RRT and in-hospital mortality in the CKD + CFI and CKD + CFNI groups were greater than in the normal group (Figure 2 and Table 3). Notes: aP<0.05 compared with the normal group; bP<0.05 compared with the CKD group. AKI 1,2 and 3 represent AKI stage 1,2 and 3. Abbreviations: AKI, acute kidney injury; CFI, cardiac function improved; CFNI, cardiac function not improved; CKD, chronic kidney disease; RRD, reversible renal dysfunction; RRT, renal replacement therapy. Figure 2 Outcomes in subgroups. Notes: *P<0.05; **P<0.01; ***P<0.001 compared to the normal group; #P<0.01 compared to the RRD + CFI group. 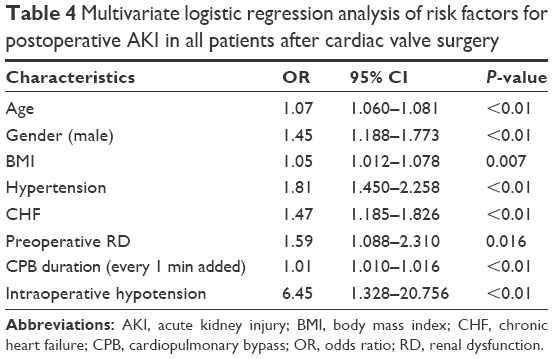 The use of multivariate logistic regression analysis revealed the independent risk factors for AKI in patients who underwent cardiac valve surgery were: age, gender (male), body mass index (BMI), hypertension, chronic heart failure (CHF), cardiopulmonary bypass (CPB) time (every 1 min added), and intraoperative hypotension (Table 4). After adjustments for age, gender, and other confounding factors, postoperative AKI and CKD were independent risk factors, with RRD not significantly adding to the risk. 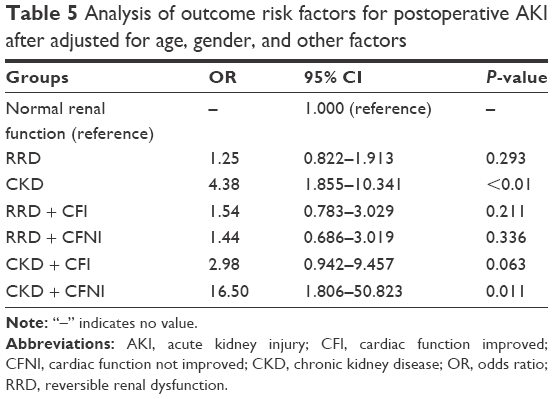 Further analysis showed that CKD + CFNI was a highly significant independent risk factor for AKI (Table 5). Abbreviations: AKI, acute kidney injury; BMI, body mass index; CHF, chronic heart failure; CPB, cardiopulmonary bypass; OR, odds ratio; RD, renal dysfunction. Note: “–” indicates no value. Abbreviations: AKI, acute kidney injury; CFI, cardiac function improved; CFNI, cardiac function not improved; CKD, chronic kidney disease; OR, odds ratio; RRD, reversible renal dysfunction. Independent risk factors for AKI in preoperative RD patients were age, gender (male), hypertension, diabetes, CHF, CPB time (every 1 min added), and intraoperative hypotension, while improved cardiac function after surgery can reduce the risk (Table 6). Abbreviations: AKI, acute kidney injury; CHF, chronic heart failure; CPB, cardiopulmonary bypass; OR, odds ratio; RD, renal dysfunction. Our results have shown that of the 301 RD patients who underwent valve surgery, 84% were diagnosed with RRD while only 16% with CKD. RD can be acute (AKI) or chronic (CKD). The causes of AKI can be broadly divided into three pathophysiological categories namely prerenal, intrarenal or intrinsic, and postrenal.14 Prerenal AKI is usually caused by renal hypoperfusion due to sepsis or heart failure, and is often readily reversible. Intrarenal AKI is usually caused by progression of prerenal azotemia and worsening ischemia, which are not easy to reverse. Postrenal AKI is often found in patients presenting with prostatic hypertrophy or retroperitoneal disorders. Patients undergoing cardiac valve surgery often have a reduced cardiac output (CO) and decreased effective intravascular volume, which lead to renal hypoperfusion and ischemia. Thus, the major type of RD may be prerenal AKI with most patients not having progressed into CKD. In recent years, much attention has been paid to CRS, which is common in patients undergoing cardiac surgery.17–19 CRS type 2 is caused by chronic heart failure (CHF) leading to kidney injury or dysfunction,18 with CKD being diagnosed in 26%–63% of CHF patients.20 Nguyen et al found that preexisting RD (eGFR <60 mL/min/1.73 m2) occurred in 32% of aortic valve replacement patients, and that RD was associated with the period of time spent in hospital, the duration in the ICU, and increased in-hospital mortality.21 RD can also be triggered by rapidly worsening cardiac function, which is termed as CRS type 1, and it mostly occurs in patients with ADHF.22,23 In our study of 4,805 patients who underwent cardiac valve surgery, only 6% had a preoperative SCr level >1.2 mg/dL, much lower values than reported in the above studies. Thus, it can be inferred that most RD patients were not be considered for surgery in our hospital, even though the majority of them may not be susceptible to AKI. The most important observation in the present study was that preoperative RRD did not add to the risk of postoperative AKI; only CKD did. For CKD patients, the kidney often has fibrosis and necrosis of the glomerulus, which are irreversible by surgery. Therefore, the management of perioperative modifiable factors such as anemia, diabetes, contrast-media insult, and fluid resuscitation should be enhanced if surgery is necessary. In RRD patients, prerenal injury in its early stages can often be rapidly corrected by returning the effective arterial volume to normal to facilitate early surgical intervention. A number of studies have also reported that impaired renal function can be improved by cardiac resynchronization24 or left ventricular assist devices.25 The type of RD should be judged according to a patient’s history, symptoms, laboratory examinations, and other investigations such as renal ultrasound and so on, and even family history. Mild elevated SCr levels or decreased eGFR does not mean mild injury of the kidney; also high level of SCr does not necessarily equate to CKD. The diagnosis is often difficult because of a lack of basic renal function in most patients so that experienced nephrologists are necessarily required. Another important finding of our study was that improved postoperative cardiac function can significantly reduce the risk of postoperative AKI. Valve disorder is often caused by rheumatism or congenital disease. The progression is very slow, even over decades, so that the majority of patients have progressive heart failure. Our results also showed a high proportion of CHF (Table 1), but that 58% of patients had improved cardiac function after surgery. On the one hand, cardiac surgery is an important cause of postoperative AKI, while on the other hand, surgery of this type is the only choice for patients with severe heart disease, which can improve cardiac function and relieve hypoperfusion of the kidneys. Our study has some limitations. It was a single-center retrospective study that lacked follow-up of long-term outcomes of cardiac and renal functions. The incomplete data about basic renal functions in some patients may lead to bias for the diagnosis of the type of RD, and further studies are necessary. It is important to remember that the risk of preoperative RD patients undergoing cardiac valve surgery depends on the type of RD. Preoperative CKD is an independent risk factor for postoperative AKI, suggesting that the indication for surgery should be made with more caution. RRD did not add to the risk, so the surgery should be carried out as soon as possible. The work was supported by The Project of Shanghai Municipal Commission of Health and Family Planning (2013SY048), The Projects of Science and Technology Commission of Shanghai Municipality (14DZ2260200) the Project of Shanghai Key Laboratory of Kidney and Blood Purification). Gaffney AM, Sladen RN. Acute kidney injury in cardiac surgery. Curr Opin Anaesthesiol. 2015;28(1):50–59. Xu JR, Zhu JM, Jiang J, et al. Risk factors for long-term mortality and progressive chronic kidney disease associated with acute kidney injury after cardiac surgery. Medicine (Baltimore). 2015;94(45):e2025. Hobson C, Ozrazgat-Baslanti T, Kuxhausen A, et al. Cost and mortality associated with postoperative acute kidney injury. Ann Surg. 2015;261(6):1207–1214. Mehta RH, Grab JD, O’Brien SM, et al. Bedside tool for predicting the risk of postoperative dialysis in patients undergoing cardiac surgery. Circulation. 2006;114(21):2208–2216; quiz 2208. Wijeysundera DN, Karkouti K, Dupuis JY, et al. Derivation and validation of a simplified predictive index for renal replacement therapy after cardiac surgery. JAMA. 2007;297(16):1801–1809. Jyrala A, Weiss RE, Jeffries RA, Kay GL. Effect of mild renal dysfunction (s-crea 1.2–2.2 mg/dl) on presentation characteristics and short- and long-term outcomes of on-pump cardiac surgery patients. Interact Cardiovasc Thorac Surg. 2010;10(5):777–782. 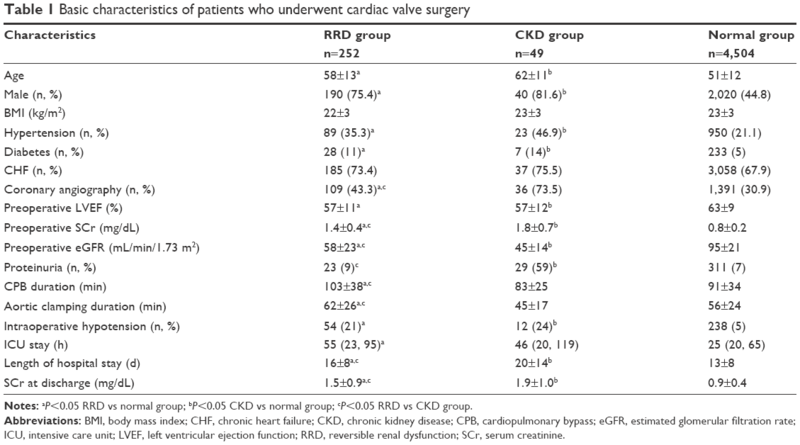 Aljadayel HA, AlKanj H, Koja S, Butruss F. Does the preoperative mild renal dysfunction effect mortality and morbidity following valve cardiac surgery? Indian Heart J. 2016;68(2):138–142. Mooney JF, Chow CK, Hillis GS. Perioperative renal function and surgical outcome. Curr Opin Anaesthesiol. 2014;27(2):195–200. Mathew A, Devereaux PJ, O’Hare A, et al. Chronic kidney disease and postoperative mortality: a systematic review and meta-analysis. Kidney Int. 2008;73(9):1069–1081. Shavit L, Lifschitz M, Slotki I, et al. Preoperative renal dysfunction and clinical outcomes of cardiac surgery in octogenarians. Exp Gerontol. 2013;48(3):364–370. Al-Sarraf N, Thalib L, Hughes A, et al. The effect of preoperative renal dysfunction with or without dialysis on early postoperative outcome following cardiac surgery. Int J Surg. 2011;9(2):183–187. Group KDIGOKAKIW. KDIGO Clinical Practice Guideline for Acute kidney Injury. Kidney Int Suppl. 2012;2(1):1–138. National Kidney Foundation. K/DOQI clinical practice guidelines for chronic kidney disease: evaluation, classification, and stratification. Am J Kidney Dis. 2002;39(2 Suppl 1):S1–S266. Basile DP, Anderson MD, Sutton TA. Pathophysiology of acute kidney injury. Compr Physiol. 2012;2(2):1303–1353. Volkmann MA, Behr PE, Burmeister JE, et al. Insuficiência renal oculta acarreta risco elevado de mortalidade após cirurgia de revascularização miocárdica. [Hidden renal dysfunction causes increased in-hospital mortality risk after coronary artery bypass graft surgery]. Rev Bras Cir Cardiovasc. 2011;26(3):319–325. Portuguese. Xu JR, Teng J, Fang Y, et al. [The risk factors and prognosis of acute kidney injury after cardiac surgery: a prospective cohort study of 4007 cases]. Zhonghua Nei Ke Za Zhi. 2012;51(12):943–947. Chinese. Vandenberghe W, Gevaert S, Kellum JA, et al. Acute kidney injury in cardiorenal syndrome type 1 patients: a systematic review and meta-analysis. Cardiorenal Med. 2016;6(2):116–128. Angelini A, Castellani C, Virzi GM, et al. The role of congestion in cardiorenal syndrome type 2: new pathophysiological insights into an experimental model of heart failure. Cardiorenal Med. 2015;6(1):61–72. Ronco C, Haapio M, House AA, Anavekar N, Bellomo R. Cardiorenal syndrome. J Am Coll Cardiol. 2008;52(19):1527–1539. Cruz DN, Bagshaw SM. Heart-kidney interaction: epidemiology of cardiorenal syndromes. Int J Nephrol. 2010;2011:351291. Nguyen TC, Babaliaros VC, Razavi SA, et al. Impact of varying degrees of renal dysfunction on transcatheter and surgical aortic valve replacement. J Thorac Cardiovasc Surg. 2013;146(6):1399–1406; discussion 13406–13407. Heywood JT, Fonarow GC, Costanzo MR, Mathur VS, Wigneswaran JR, Wynne J; ADHERE Scientific Advisory Committee and Investigators. High prevalence of renal dysfunction and its impact on outcome in 118,465 patients hospitalized with acute decompensated heart failure: a report from the ADHERE database. J Card Fail. 2007;13(6):422–430. Cheng H, Chen YP. Clinical prediction scores for type 1 cardiorenal syndrome derived and validated in chinese cohorts. Cardiorenal Med. 2015;5(1):12–19. Boerrigter G, Costello-Boerrigter LC, Abraham WT, et al. Cardiac resynchronization therapy improves renal function in human heart failure with reduced glomerular filtration rate. J Card Fail. 2008;14(7):539–546. Tromp TR, de Jonge N, Joles JA. Left ventricular assist devices: a kidney’s perspective. Heart Fail Rev. 2015;20(4):519–532.